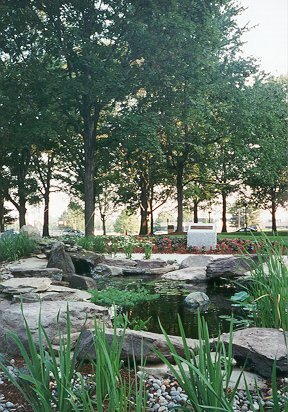 On August 14, 2000 Social Security Commissioner Kenneth Apfel dedicated a 65th Anniversary Garden on the grounds of SSA headquarters in Baltimore. The Garden is dedicated to the thousands of Social Security employees, past and present, who have labored to build this American Cornerstone. 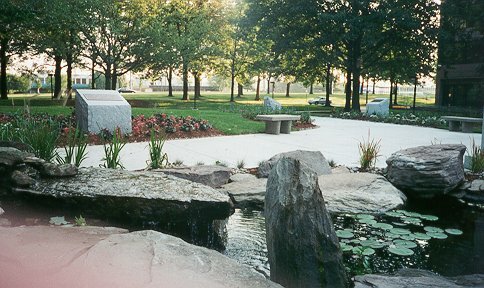 The Garden consists of a small pond, with a bust of President Roosevelt overlooking the site; and granite stones for each President since FDR, commemorating a quotation from each President regarding Social Security. The Mistress of Ceremonies for the event was SSA Deputy Commissioner for Finance, Assessment & Management, Yvette Jackson. SSA's Chief of Staff, Brian Coyne, was also a featured speaker. Social Security officials await start of program. The ceremonial ribbon-cutting, officially opening the Garden. Commissioner Apfel prepares to unveil the bust of President Roosevelt. Frontal view of FDR bust. Side view of FDR bust. Full-length view of the FDR pedestal and bust. Full-length view of the FDR pedestal and bust. Photo by Gloria Tong. Each President following FDR has a granite stone with a brass plaque commemorating a memorable quotation from their comments regarding Social Security. Photo by Gloria Tong. A small pond with running water is the centerpiece of the Garden. Photo by Gloria Tong. Another view of the pond. Photo by Gloria Tong. 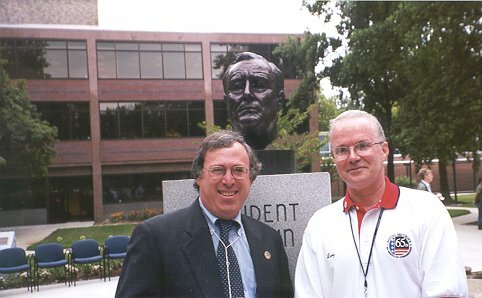 Professor Edward Berkowitz (left) Chairman of the History Department at George Washington University and renowed expert on the history of Social Security, poses with SSA Historian Larry DeWitt in front of the FDR bust. SSA Architect, Yolanda Koh (right), who designed the Garden, and SSA Associate Commissioner for Facilities Management, Andria Childs, who is the executive in charge of the Garden's creation, pose in front of the FDR bust.